Tokyo, Japan, September 26, 2016 --- Hitachi, Ltd. (TSE: 6501, “Hitachi”) and Hitachi Building Systems Co., Ltd. announced today that on September 30 they will launch a new machine room-less elevator for Asia and the Middle East. This elevator will be gradually released over time across countries in both regions. The new elevator model, which was developed in Japan, is equipped with Hitachi's latest technologies. In addition to its excellent design, it also offers uniform basic specifications to meet the different standards of each country and respond flexibly and quickly to the needs of customers. It features the latest design and functions developed for the Japanese market, ensuring a high level of safety based on the electronic safety technology. It also uses a regenerative operation system and LEDs to save on energy, while a deodorizing ion generator helps to create a clean and comfortable environment in the car. In recent years, there has been a growing demand for machine room-less elevators in the Asian and the Middle Eastern markets. Machine room-less elevators are designed to have no machine room where a traction machine, a control board, and other lifting components are normally installed. Instead, these components are housed inside the hoistway. Until now, Hitachi's international elevator business has brought machine room-less elevators originally developed for other markets to Asian and Middle Eastern countries by customizing them to meet the legal and technical requirements of each country. With the launch of this new elevator model, it will be able to provide customers with faster and more flexible services. 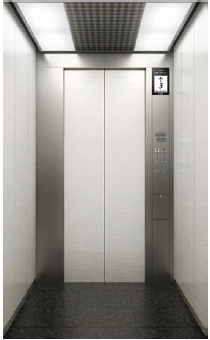 Hitachi will begin sales of this new elevator model in the Middle East and countries across Asia, including Kingdom of Thailand, Republic of the Philippines, and India. Through these activities, it aims to receive orders of approximately 5,000 units in the regions. While conventional models use mechanical safety devices such as switches and sensors, the new elevator employs high-precision electronic safety technology with a new microcomputer*1 control system, resulting in an even higher level of safety. This is a new technology that is used to control Hitachi's ultra-high-speed elevators that run at 1,200 m/min. An infrared sensor at the doors prevents boarding and departing passengers from getting caught between the doors. This sensor also flashes red to let users know that the doors are closing. The new elevator model uses LED lights in the car, helping to reduce*2 the lighting power to levels lower than conventional models with fluorescent lights. In addition, the traction mechanism acts as a power generator to transmit power back to the electrical network in the building. An ion generator installed on the car supplies ions with a deodorizing effect, helping to keep the air in the car clean. This new elevator is designed to meet a wide range of customer needs. It features the latest specifications for the Japanese market, along with a number of car ceiling designs, liquid crystal displays that show all kinds of information, and other quality design features. Microcomputer: A small built-in computer. Rate of reduction varies by model.